Lisa Dixon's Website | Jo Menhinick Design Ltd.
Lisa approached us to design her website because she wanted a site she could add news items to regularly and access help just an email away whenever needed. Lisa already had a logo so we created some graphic imagery with this to enhance the site and follow through cohesive branding across the website. 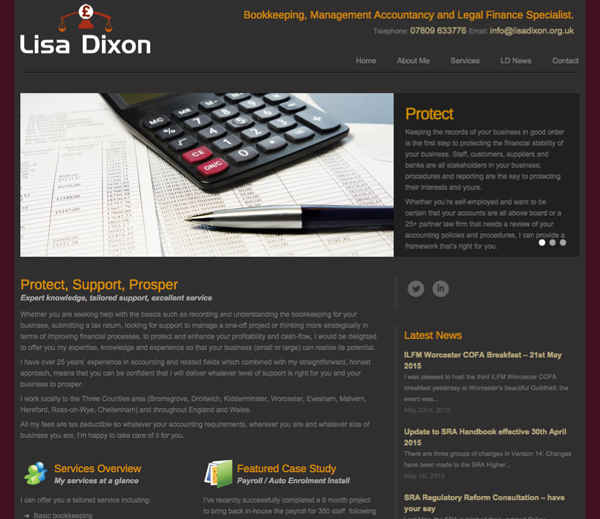 The website is proving a useful tool for helping Lisa keep her clients up to date with latest developments and news in the accountancy world. This WordPress based website also feature a Twitter feed and Social Media share links on all news features.